Chief executive and co-founder Dellen Soh usually receives an amused glance or smile in response, but he has a good reason for asking. 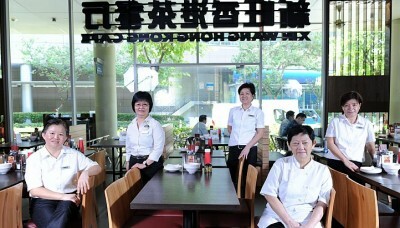 Hiring older workers has worked well for the company in addressing manpower shortages in its restaurants and kitchens. Some 25 per cent of its 1,100 employees are aged 50 or above. Hired under the company's Golden Folks Programme which began two years ago, they do both service and kitchen work in the group's chains such as ThaiExpress, New York New York and Xin Wang Hong Kong Cafe. While older workers will not replace foreign labour - which makes up 40 per cent of ThaiExpress Concepts' workforce - Mr Soh says they are a good source of manpower for its labour-intensive operations. Older workers, he notes, are more stable - their turnover rate is just 2 to 3 per cent a year, compared to 8 per cent across all workers. 'They have staying power, dedication and take pride in their duties,' says Mr Soh. He discovered their strengths, he says, when he chatted to older workers at hawker centres and petrol stations. 'Many do not mind repetitive job duties, and prefer to work closer to home and not in shifts that are too long,' he says. ThaiExpress Concepts also tries to deploy these workers according to their preferences. For instance, someone who does not like to talk to customers but who does not mind clearing plates will be hired to do just that. And someone who likes talking will be put in charge of helping customers apply for the group's membership rewards programme. By hiring older workers, the company also gets another benefit: an 8 per cent wage subsidy from the Special Employment Credit introduced in this year's Budget.